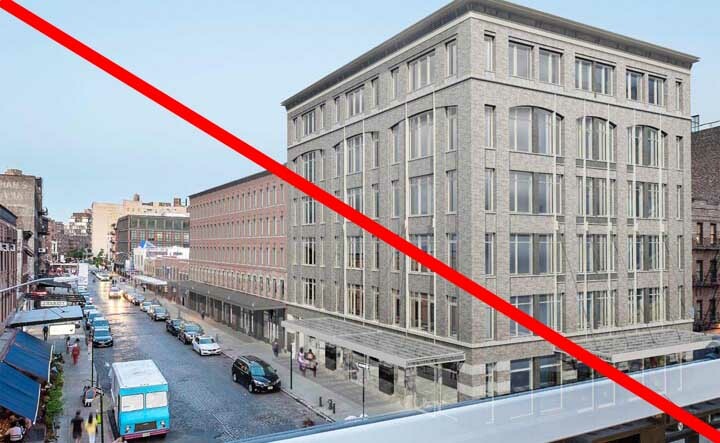 The revised plans submitted by Aurora Capital for 46-74 Gansevoort Street fail to meet the conditions that the Landmarks Preservation Commission set forth during the February 9th, 2016 public meeting. We strongly urge that LPC require the heights of the proposed buildings at 74 Gansevoort Street and 60-68 Gansevoort Street be further reduced, per the commissioners’ own instructions. Additionally, we ask that the hearing be re-opened so that the public can address the flaws in this newly revised and highly controversial proposal. • The developer has ignored the commissioners’ directive that in addition to removing the penthouse, the height of this building should be significantly lowered. The revised building (exclusive of the penthouse) is a mere 2 feet lower than the previous proposal. The proposed building is still grossly out-of-scale and out-of-charcter with the rest of the block. Commissioner Bland stated on February 9th that the height of this building exclusive of the penthouse should be reduced by one floor; Commissioners Gustafsson, Chapin, and Vauss said that they agreed with him. Commissioner Shamir-Baron stated she wished to preserve the existing two-story facades. However, the developer attempts to justify this building’s size by referring to various WAREHOUSE buildings in the district, ignoring the commissioners’ directive that the height of this building should be considered in the context of the district’s LOFT buildings (which are in general considerably smaller than the warehouse structures). The heights of the seven loft buildings in the district range from 38 feet to 73 feet; they average about 55 feet in height. By contrast, the developer’s revised building at 74 Gansevoort Street is 82 feet tall (97 feet tall when the large array of mechanicals is included). The proposed building at 74 Gansevoort Street should be lowered to about 55 feet in height (including cornice) so as to be comparable with the average loft building. • The commissioners were clear that the new building at this site should be no higher than the previously existing tenements. 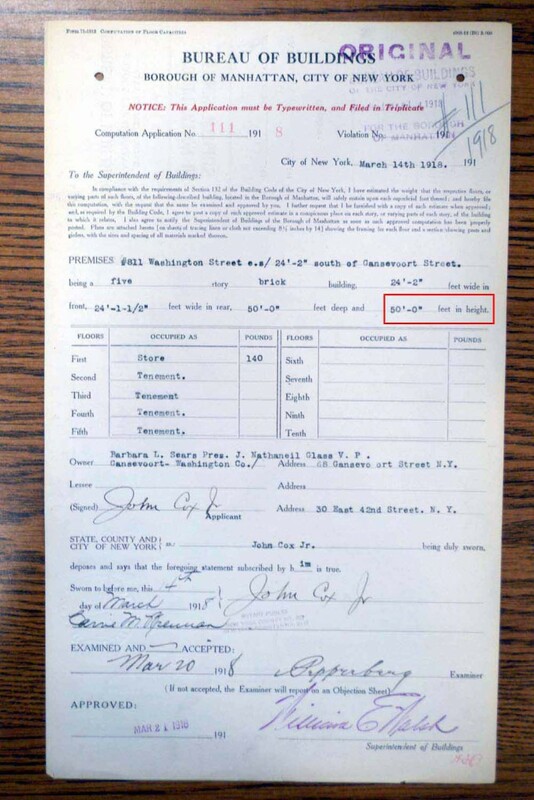 20 individual DOB records show that the tenements at this location were between 50 and 55 feet tall. However, the developer is now proposing a structure that would be 62 feet tall (70 feet tall including mechanicals). The proposed new building at 60-68 Gansevoort should be lowered to a height of no more than 50-55 feet including cornice. • Note that photos and the developer’s own diagrams show that the tenements at 54-46, 60-68, and 70-74 Gansevoort Street were all approximately the same height. We have found a total of 30 individual DOB records for these buildings showing heights of between 50 and 55 feet. 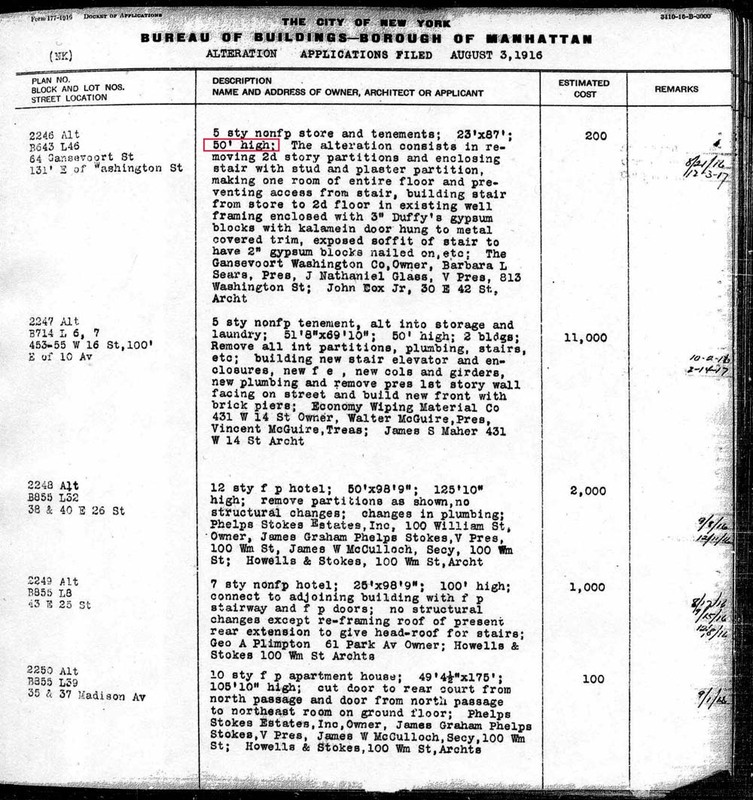 A list of these records is attached; scans of the records can be viewed here. We are disappointed that LPC has arbitrarily reached back to an earlier stage in the district’s history to justify replacing existing low-rise market buildings with massive new construction. Nonetheless, if the rationale is to return Gansevoort Street to its earlier tenement configuration, then the new buildings at 60-68 and 74 Gansevoort must conform to the size of their predecessors. Scans of each of these records can be viewed here. *the “3” is somewhat illegible; possibly this permit number is 604 or 804.